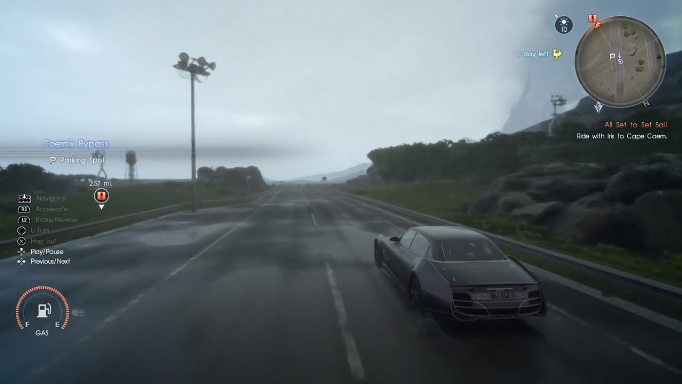 This page contains a detailed walkthrough of Chapter 6 – A Way Forward in Final Fantasy XV, including quests, objectives, items, enemies and bosses encountered in the game. Exit the hotel and head out. Go through the alley in middle and pick up 1x Debased Silverpiece. Afterwards, meet up with Iris at the gas station. You can also stock up on some healing items at the shop and cafe. When you talk to Iris, you will be warned that you won’t be returning to this area for some time so be sure to have explored the area first. When you’re ready, talk to Iris again to proceed to Cape Caem. 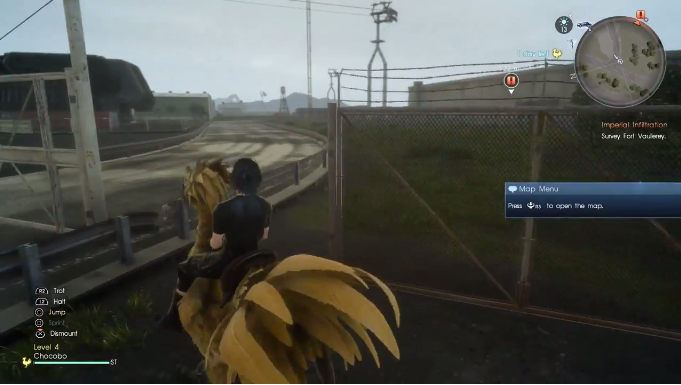 Along the road, you will pass Coernix Bypass. You can choose to pull over and explore this area, or continue on your journey. Further along the road, the party will spot an Imperial ship. 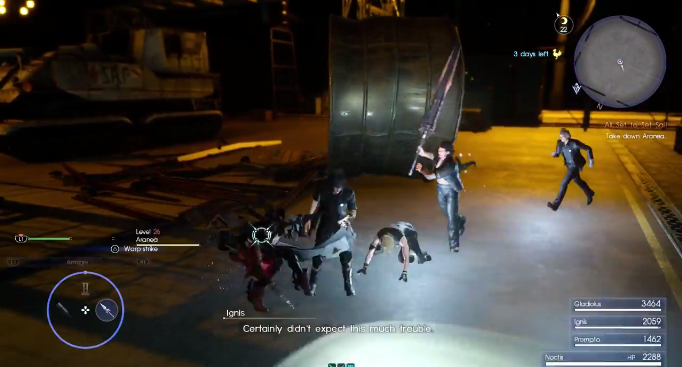 The party then sees the chance to avenge Jared’s death. From here, the next quest will begin. The party will arrive at Old Lestallum. Take the time to explore the area. You can choose to go down the stairs to the grass and examine the small hills. Turn around and head for the small hills. On one of the hills, you will find 1x Beetle Shell. Afterwards, head back up to the town go to the bridge leaving the area. 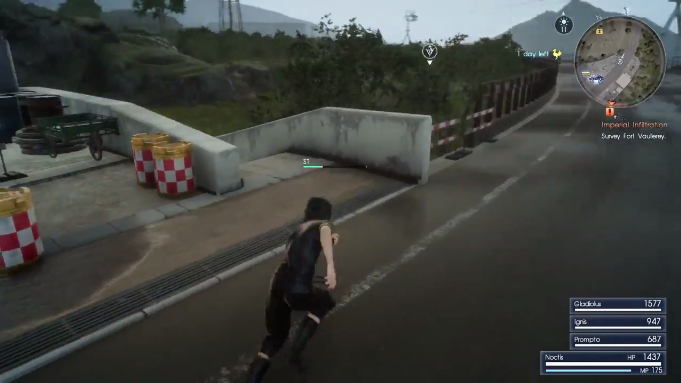 Just keep following the direction indicated by the quest marker. You’ll come across a three-way intersection on the road. 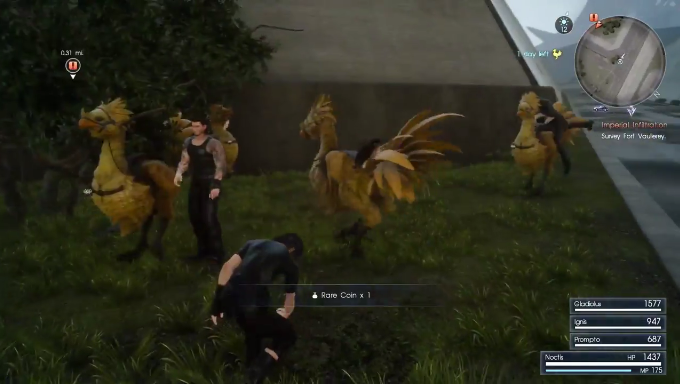 Walk to the grassy part in the middle to pick up 1x Rare Coin. Continue along the road by taking the path north (or straight ahead from where you came). You will soon arrive near the entrance of Fort Vaullerey. After arriving at the gate, it will be sealed. 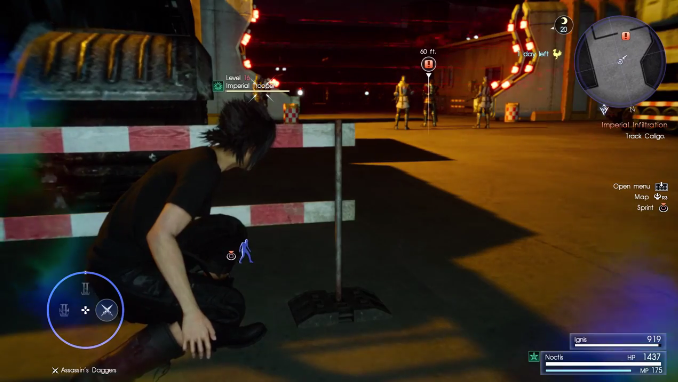 There is however a gap between the gate and the fence on the right that you can pass through. Once inside the Fort, head to the building on the upper left. There will be four Battery Solders and an MA Veles so be sure to engage them first with a warp-strike. Quickly take out enemy infantry first and then focus your attention to the MA Veles. Breaking its legs will make it vulnerable so be sure to surprise them with warp strikes before they notice you. Also watch out for its stomp attack. 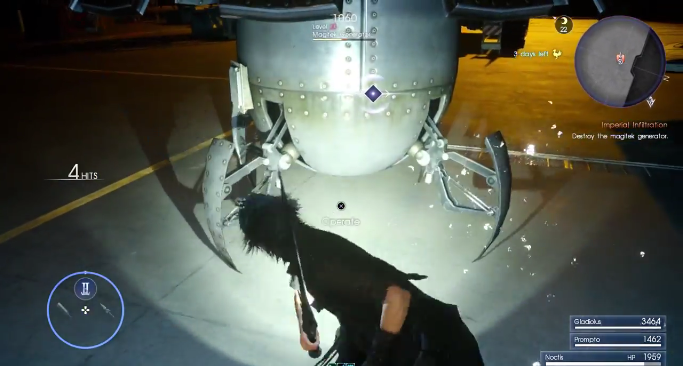 After taking out the enemies, continue following the quest marker. You will catch sight of another MA Veles which you must engage. Battery Soldiers will also come to its aid. 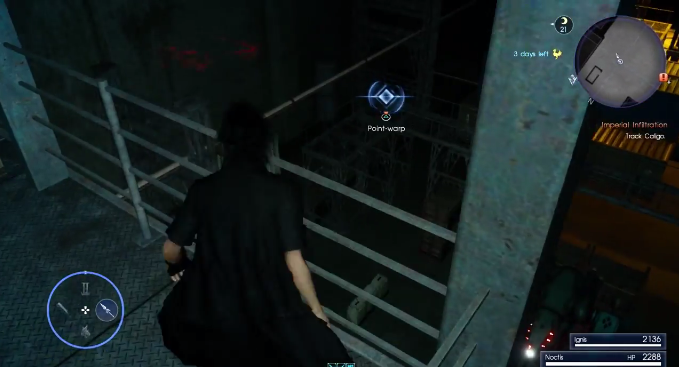 If you get overwhelmed, there is a point-warp location up ahead on one of the buildings so you can recover HP and MP. Continue towards the quest marker and another squad with an MA Veles and Imperial Troopers will be encountered. 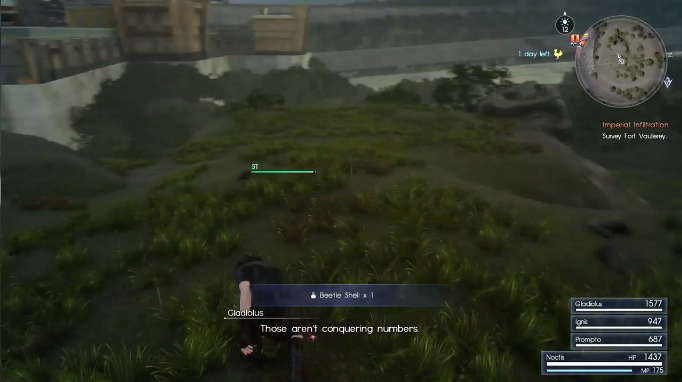 After clearing the enemies, continue in the direction of the quest marker. Go up the ramp to find more enemies. They will be more spread out this time. Upon getting up to the area, there will be an Imperial Sniper positioned on the spiral stairs. Use warp-strike to take him out first as he will be a problem. 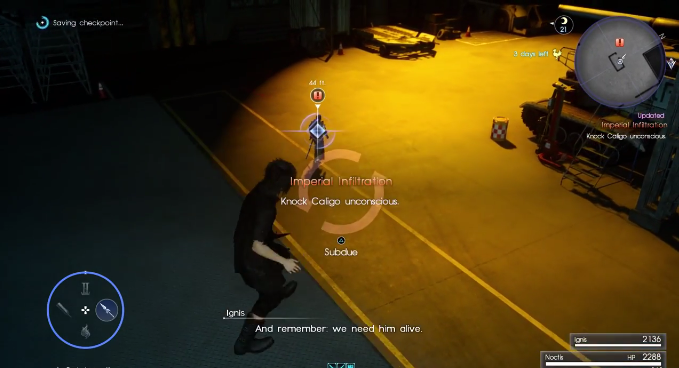 After killing him, take care of the other enemies. 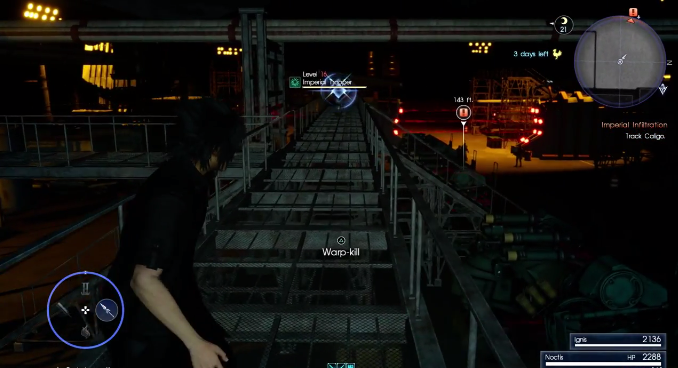 After clearing the area of enemies, head up the spiral stairs. At the topmost area, the party will discuss their plan on how to go on in their mission. Here, they agree to find and capture the commander of the fortress. 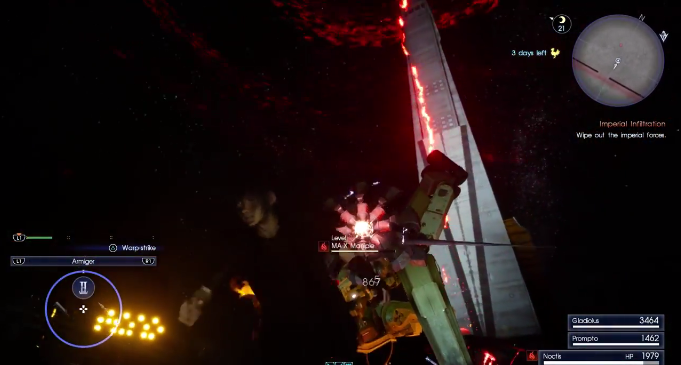 The party will be split into two groups (Prompto with Gladiolus and Noctis with Ignis) and wait until dark to commence their operation. 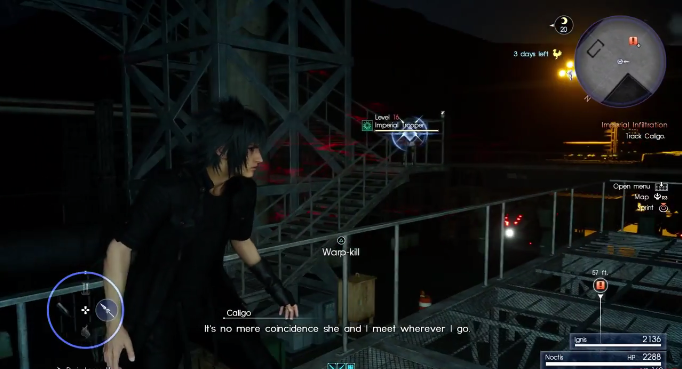 At night, Noctis’s party catches sight of Caligo, an official of the Empire of Niflheim. They agree to trail him and seize without being detected. Be careful not to get spotted or the quest will fail. 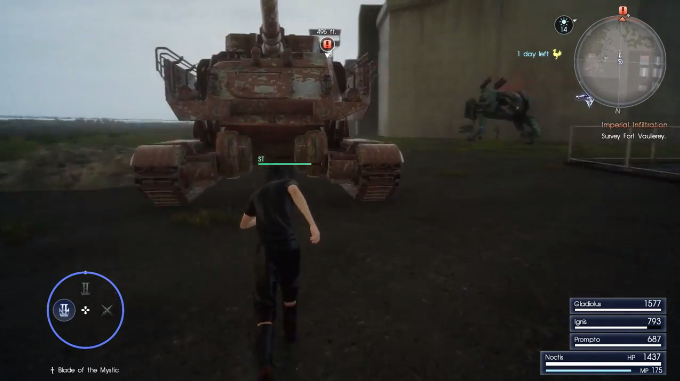 Sneak and hug the left side of the tank and move towards Ignis. From there, you can peer from the side of the tank and wait for Caligo to enter the gate. You can ignore the guards that are left at the gate. 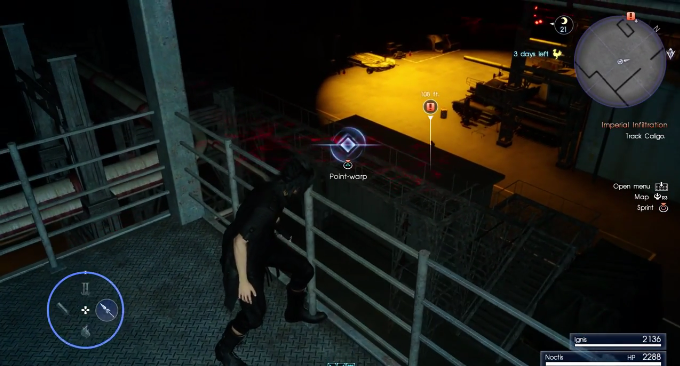 Proceed forward to Ignis again while still sneaking and taking cover on this side of the area. Peer at the corner again and there will be an Imperial Trooper you need to take out. Use Warp Kill to make quick work of him. 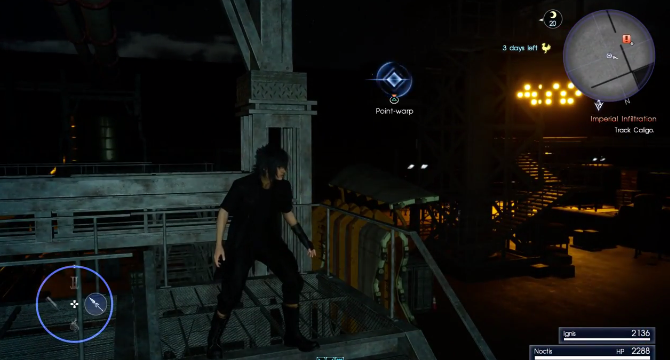 After killing the Imperial Trooper, head up the stairs and walk on the metal overpass. You will catch sight of another Imperial Trooper that you can warp kill. 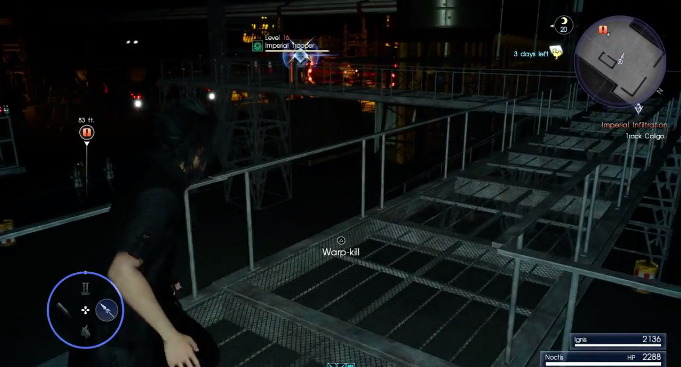 After warping and killing the enemy, look around for another enemy on the spiral stairs. Warp kill him as well. After killing the enemy, climb up the spiral stair. There, you will be able to warp to the lower metal overpass. 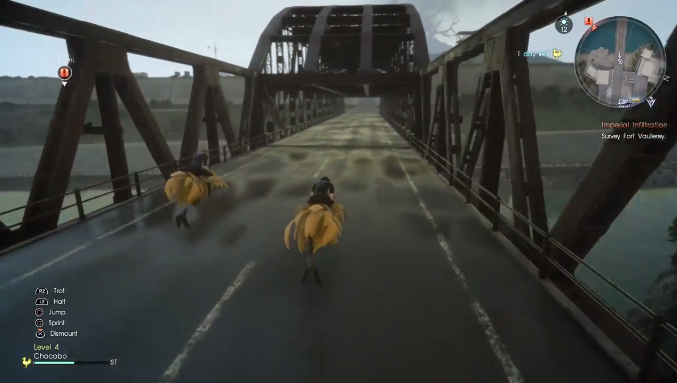 On the metal overpass, go forward. There will be another enemy to warp kill. After killing the enemy, warp to the next metal overpass up ahead. What will follow is a series of warping to different points in the fort. Use the images below as a guide. After warping to the point shown in the image above, climb the stairs. There, you can pick up 1x Mythril Shaft. 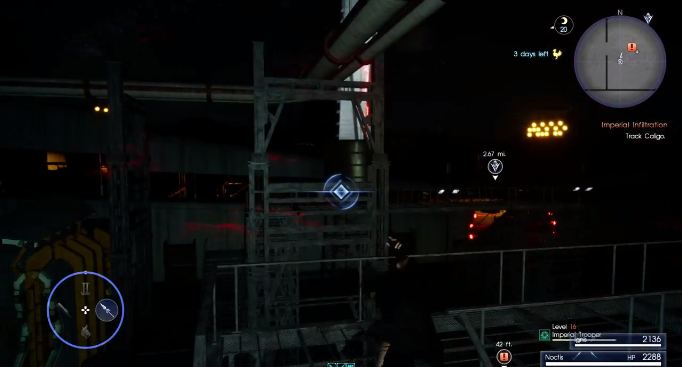 After pickin up the item, warp to the lower metal overpass where Caligo will be alone. 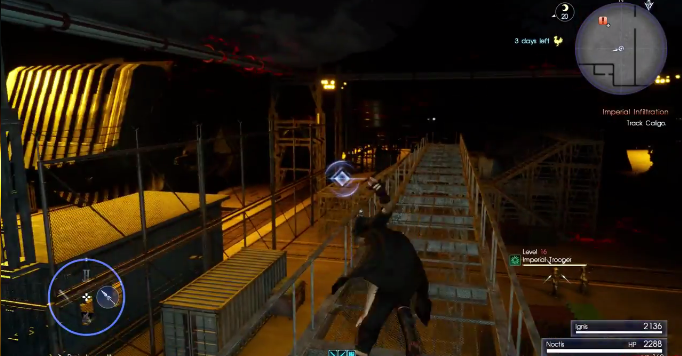 After warping, jump over the metal railing and get into position to subdue Caligo. Once you lock onto him, subdue him. 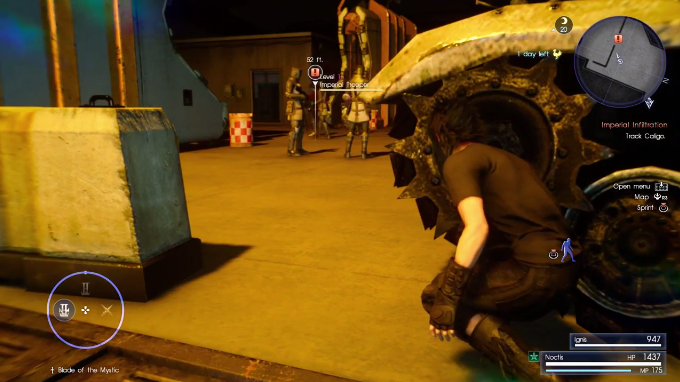 Upon subduing Caligo, the diversion that Prompto and Gladiolus planned will set off, which will cause the Fort to go on the alert. You will now need to regroup with your party. Follow the quest marker to rendezvous with the rest of the party. You will encounter a squad with an MA Veles and imperial infantry so be cautious. 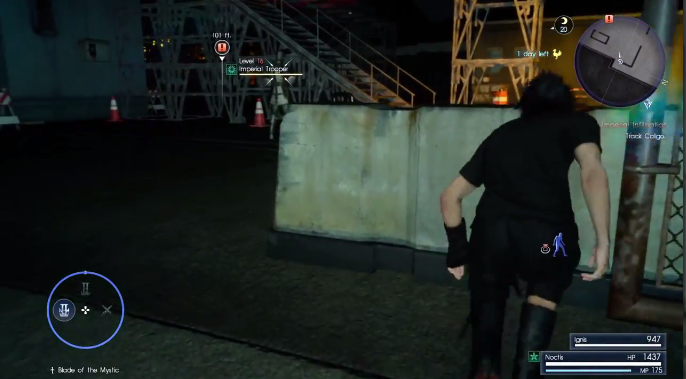 Proceed further towards the quest marker to meet up with Gladiolus and Prompto, and a boss battle will begin. 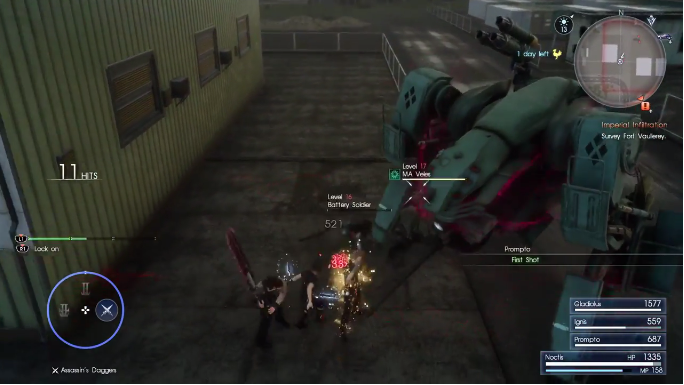 This boss MA is a rather straightforward battle. You generally want to avoid his line of fire for most of the fight. The key to beating him is when you see him exposing the red glowing shield on his left arm. 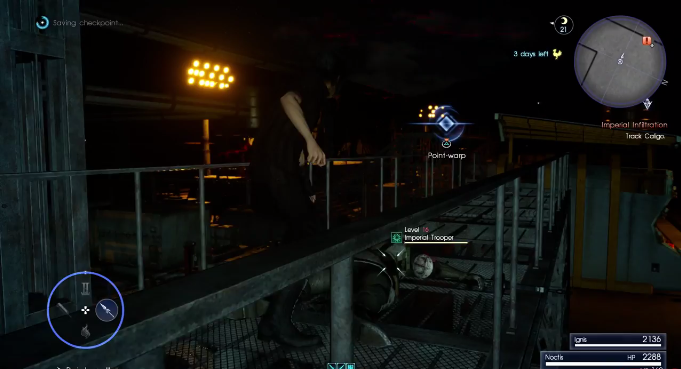 Warp strikes are very effective against this part of the boss. When you’ve broken it, he will be vulnerable so finish him off before he has time to get up. 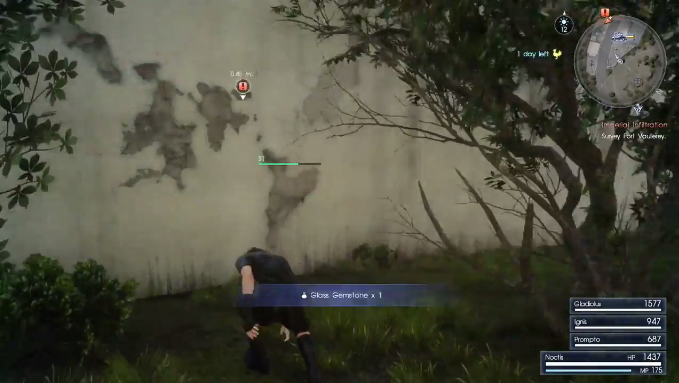 After the fight, you will need to destroy the Magitek Generator. Destroy it with a combination of your attacks. After destroying the Magitek Generator, the party will then regroup and report on the success of their mission. Their victory is short-lived however as Aranea Highwind will appear and engage the party. Aranea spends a good amount of the battle in the air. 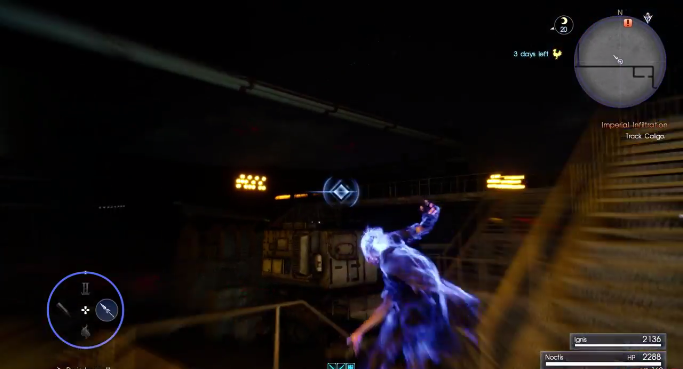 However, she will perform combos on the ground. Most of her ground combos can be dodged with good timing. 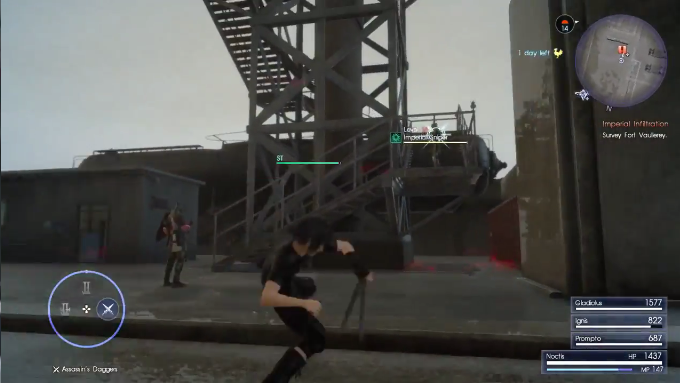 She will occasionally perform the dragoon’s signature Jump attack, so watch out for the chance to guard and parry. She can also be overwhelmed if the party surrounds her. 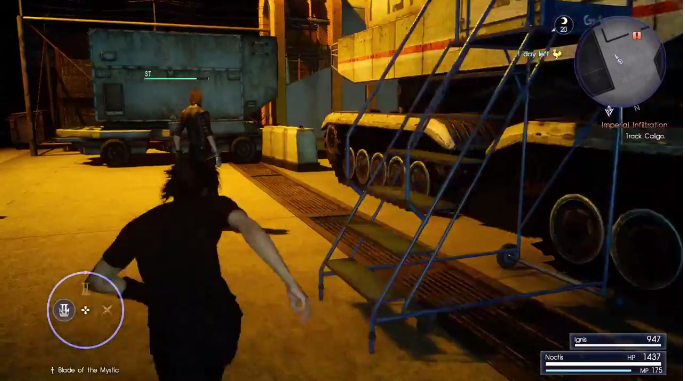 After giving her enough trouble, Aranea will take her leave, saying that she doesn’t get paid to do “overtime”. The party will then return to Old Lastellum. The party will then spend the night and set out again to Cape Caem. The drive to Cape Caem is quite long. 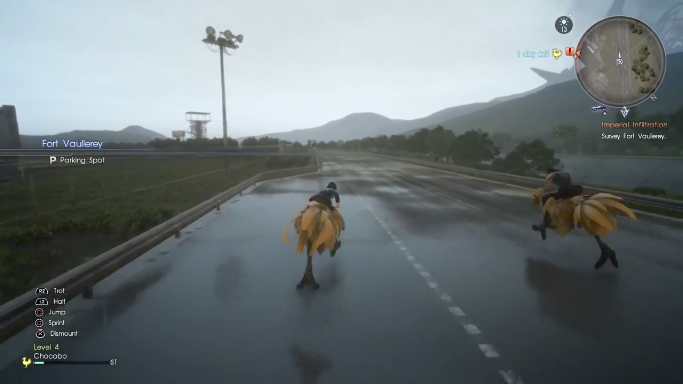 You will pass by Leirity Seaside while on the road, so have Ignis pull over if you want. You will soon arrive at Cape Caem. There will be an item stall in the area. 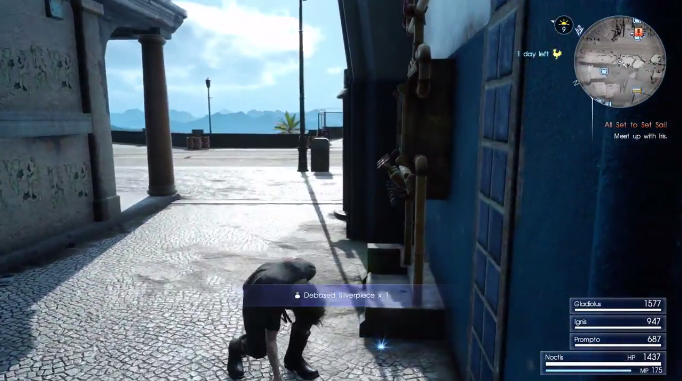 After stocking up on healing items, head for the quest marker to find Cindy. You will then part with Iris from here. Speak to Cindy again and follow her to the boat. She will then tell you that some of the boat’s parts need to be replaced, and that she hopes you might help to find them. Afterwards, follow the quest marker and speak to Talcott. 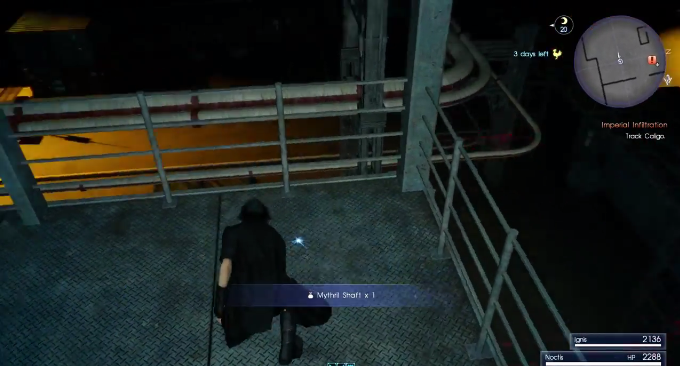 He’ll tell you that you need mythril to fix the boat, which can be found in the ruins north of your location. Talk to Iris if you’re sure you want to set out to the next destination. 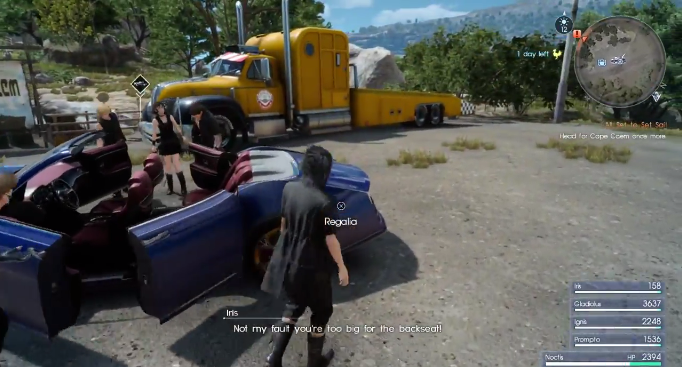 A cutscene will ensue where Gladiolus will tell you that he needs to part ways with you for a while. This concludes the walkthrough for Chapter 6 – A Way Forward.